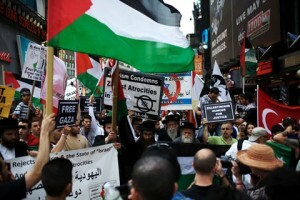 Despite the rain, around 2,000 demonstrators gathered in Midtown Manhattan on Tuesday to march in protest of Israel’s May 31st attack on the Gaza Freedom Flotilla. Only 5 days prior, many of these same activists gathered on this same city block in a significantly smaller demonstration in support of the embarking 6-ship convoy, which carried over 600 international activists and 10,000 tons of aid meant for the besieged residents of Gaza. This latest, much larger protest is one of many actions against the illegal attack across the globe, from Malaysia to Beirut to Sweden. Showing up in force were hundreds of veteran Palestinian-rights activists representing numerous organizations, including Jews Say No, the Palestinian right-to-return coalition Al-Awda, and the orthodox Anti-Zionist group Neturei Karta. But, as the large turnout suggests, there was something different about these latest protests. Condemnation of the United States and its policy of unconditional support for Israel was equally prevalent. Dana Balicki, an organizer with the peace group Code Pink, called the U.S. response “abhorrent.” Signs and chants demanded an end to U.S. military aid to Israel, which amounted to at least $7 million each day during Fiscal Year 2009, and urged President Obama to hold Israel accountable for its intransigence. Activist Debra Sweet said she felt that Americans have a particular responsibility to hold their government accountable since the U.S. provides Israel with such enormous funding. Code Pink’s Balicki stressed the need to put pressure on the Obama administration to stop letting Israel get away with continued indefensible violence against civilians. As more Americans wake up and speak out, Obama is bound to feel the pressure. Shannon Hughes is a New York City-based student studying journalism at Hunter College, where she is the president of the Campus Anti-War Network. Shannon is involved in activism locally and abroad, including in Egypt and Palestine. Ms Hughes, these protesters have no idea what happens in the real world do they? Israel has every right to defend itself. This includes inspecting aid shipments going to Gaza for weapons. Any blood spilled from the flotilla is on the idiots in charge of the flotilla and the idiots who attacked the Israeli soldiers provoking the lethal response. The IHH who owns and operated the boat is a terrorist organization masquerading as a NGO. Are these Pro Palestinian folks going to protest Hamas now? D. Killion, speaking of the real world, what about the families who have lived in Gaza for generations and are being violently forced from their homes? This was an aid mission for those who are suffering. Today Israel vows to prevent medical supplies and other aid from reaching these people. Where is the humanity? From Tahrir to Taksim, is it time for a Fifth International?